Boy, I bet if you had to guess, you wouldn't even think I knew where the furrin section was in the video store. Well, I guess we are both wrong. 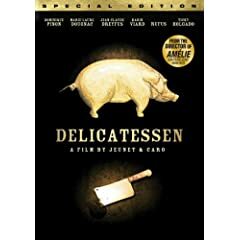 Delicatessen has become my new favorite post-apocalyptic movie of all time. It adds so much to the "genre". (See, I'm even usin fancy words and junk.) Here is just a taste. First of all, it's interesting that there seems to be some vestiges of civilization left. I think that's pretty realistic. Then, the goofy stuff they add completely makes it. The troglodytists or whichever. They reminded me of the cursed earth mutates in Judge Dredd comics... wait... I'm getting this mixed up. I think there are real troglodyte characters in Judge Dredd too... Anyway, the images in this movie make it supreme. Don't get me wrong, I don't know anything about camera angles, lighting or whatever. All's I know is that these guys knew what they were doing. Everything had this hyper-real color to it. When they'd show the butcher's face and evil grin... it looked perfect. This movie had many images and ideas in it that (As far as I know) have never been done before. I mean, filling a bathroom with water to escape an angry mob? A big group of civilized happy cannibals? A man who lives half submerged in water with an army of frogs and snails? I'd like to meet someone who didn't care for this movie. Just so's I could punch them in the face.